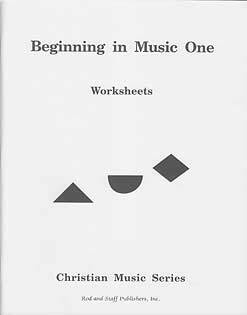 Beginning in Music One is a set of 32 one-sided, tear-out worksheets designed to teach two sets of musical characters: the syllable shapes and kinds of notes. Shapes tell the syllable name (Do, Re, Mi, etc.) and are not related to length of tone. In teaching the syllable shapes, we have ascribed to each syllable a particular color which expresses the general feeling of that tone. The worksheets drill tracing shapes, coloring shapes, choosing particular shapes from varieties of shapes, and matching the shapes to their names. The emphasis at this level is on recognition of shapes and their names. Kinds of notes (whole, half, quarter, etc.) tell the length of a tone and are unrelated to the syllable name. Notes are introduced later in this first grade course, and are covered more in depth in following grade levels. The prime concern in the first grade music class is to develop in the pupils a strong diatonic feeling (singing the scale correctly), and the ability to sing together well as a group. The use of these worksheets should be accompanied by flash card drill, scale drill, and singing of songs. You may make your own scale drills and flash cards. A set of 64 music flash cards is available from Rod and Staff Publishers. The set contains many cards relating to levels of music higher than first grade. The Teacher's Guide, included with the pupil workbook, gives much helpful advice in developing the student's singing ability. A number of musical ideas are suggested as well as other methods of developing the student's diatonic feeling.